Device Compatibility. 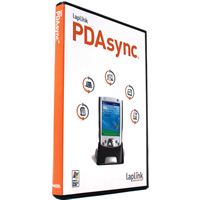 PDAsync is compatible with Palm OS, Pocket PC, Windows Mobile powered Smartphones and a number of leading PDA makers including Sony Ericsson, T-Mobile and Samsung. Scheduled Synchronization. As long as your device is connected, we make sure it’s synchronized at all times. Fast Synchronization. After the initial synchronization, PDAsync saves you time by only syncing the changes you have made instead of syncing all the data again. Profile. Multiple devices can be associated with multiple applications via profiles. Email Management. Not only does PDAsync sync your email, but it keeps track of the read/unread status of all your messages, so you don’t have to. Automatic Port and Device Detection. PDAsync automatically determines the best communication port settings during setup. Easy Installation. Wizard-based installations auto-configures most clients, and offers improved automatic mapping of categories and folders. In an increasingly mobile world, synchronizing your PC between multiple handhelds, including smart phones, PDAs and cell phones can be complicated. PDAsync provides you with simple, one-click synchronization between your mobile devices and popular applications on your Windows computer. With PDAsync, you can sync email, contacts, calendars, tasks, notes, and more from your Windows PC to your mobile device or PDA. With PDAsync you can synchronize multiple mobile devices to a single PC - including PDAs, Smartphones and Windows Mobile Supported Devices. It will also allow you to synchronize any one of your devices to a number of different PCs - giving you the most flexible synchronization solutions for your ever changing synchronization needs. Requires a mobile device and connectivity hardware (see http://www.laplink.com/pdasync/devices.html complete device compatibility list).